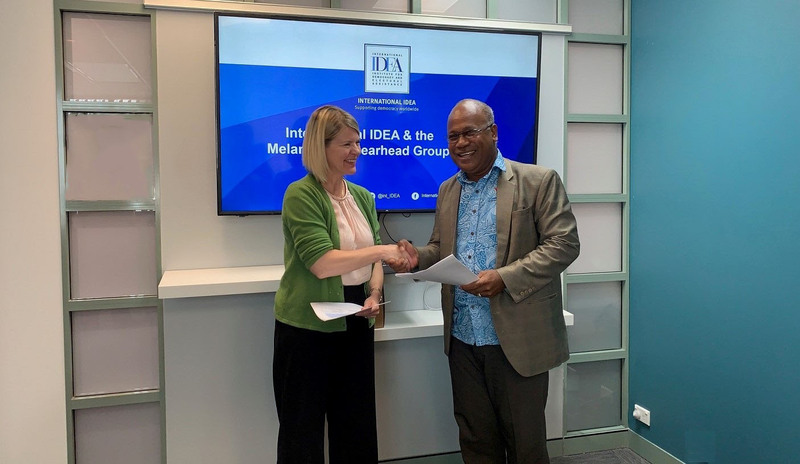 To form a closer relation with the Melanesian countries and further strengthen International IDEA’s activities in the Pacific region, an extension of the MoU was signed with the Melanesian Spearhead Group (MSG) Secretariat. The Melanesian Spearhead Group is a sub-regional organization established to promote and strengthen Melanesian cultures, traditions, values and sovereign equality, and foster sustainable economic and technical cooperation amongst Members and Development Partners. Its Secretariat is based in Vanuatu and headed by Director General, Ambassador Amena Yauvoli. The MoU seeks to establish a mutually cooperative relationship in promoting and developing democracy and democratic institutions in Melanesia, providing the fora for peer to peer exchanges, experiences sharing based on mutual respect, and to cooperate in developing and strengthening political/democratic institutions and processes. “International IDEA needs to focus on understanding how climate change will shape democracies and how democracies can respond to this most critical global challenge of our times—there is much to learn and study from how the Pacific islands have been responding”, said Leena Rikkilä-Tamang, Director for Asia and the Pacific programme of International IDEA. Research on measures toward political stability in the sub-region. Melanesian Spearhead Group Secretariat also expressed interest in learning more about International IDEA facilitated Inter Regional Dialogue on Democracy (IRDD) process of coming together of regional organizations from around the world including EU, AU, ASEAN, OA and others on issues of common interest such as the SDGs. “These programmes are well suited to advance the MSG Secretariat’s commitments and we look forward to working with development partners, donors and key partners like International IDEA to advance these priorities. A strong subregion will make for a stronger regionalism,” Ambassador Yauvoli emphasized. MSG Members include Fiji, Solomon Islands, Vanuatu, Papua New Guinea, and Kanak Socialist National Liberation Front of the New Caledonia. Indonesia is an Associate Member while Timor Leste and the United Liberation Movement for West Papua are Observers. and Romulo Nayacalevu from the MSG Secretariat. Image credit: International IDEA.